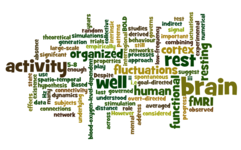 Despite important progress over the last few years, brain functional connectivity at rest, i.e., under no stimulation and in the absence of any overt-directed behaviour is still not well understood [1, 2]. In studies on goal-directed mental activity, spontaneous brain activity at rest has been considered as random enough to be averaged out across many trials. However, well organized spatio-temporal low-frequency fluctuations (<0.1 Hz) have been observed in blood-oxygen-level-dependent (BOLD) fMRI signal of human subjects during rest [3, 4]. These well organized patterns of activity suggest the existence of underlying dynamics that governs intrinsic brain processes [5-8]. We will address resting brain fluctuations in fMRI data combining experimental and theoretical approach. 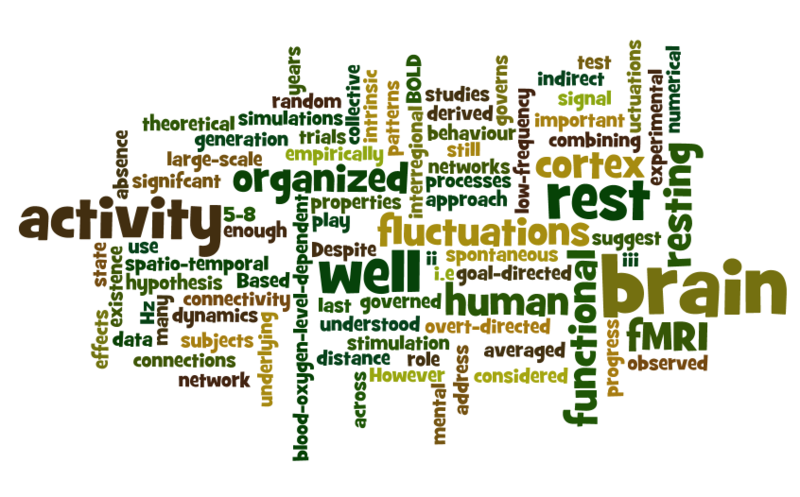 Based on empirically derived large-scale functional networks of the human cortex we will use numerical simulations to test hypothesis that (i) indirect connections, (ii) interregional distance, and (iii) collective effects governed by network properties of the cortex play significant a role in generation of the resting state fluctuations. J. S. Damoiseaux, S. A. R. B. Rombouts, F. Barkhof, P. Scheltens, C. J. Stam, S. M. Smith, and C. F. Beckmann: Consistent resting-state networks across healthy subjects, Proceedings of the National Academy of Sciences of the United States of America 103, 13848 (2006). J. L. Vincent, G. H. Patel, M. D. Fox, A. Z. Snyder, J. T. Baker, D. C. Van Essen, J. M. Zempel, L. H. Snyder, M. Corbetta, and M. E. Raichle: Intrinsic functional architecture in the anaesthetized monkey brain, Nature 447, 83 (2007). B. Biswal, F. Z. Yetkin, V. M. Haughton, and J. S. Hyde: Functional connectivity in the motor cortex of resting human brain using echo-planar mri., Magnetic Resonance in Medicine 34, 537 (1995). S. L. Bressler and V. Menon: Large-scale brain networks in cognition: emerging methods and principles, Trends in Cognitive Sciences 14, 277 (2010). C. J. Honey, R. Kötter, M. Breakspear, and O. Sporns: Network structure of cerebral cortex shapes functional connectivity on multiple time scales, Proc. Natl. Acad. Sci. U.S.A. 104, 10240 (2007). A. Ghosh, Y. Rho, A. R. McIntosh, R. Kötter, and V. K. Jirsa: Cortical network dynamics with time delays reveals functional connectivity in the resting brain, Cogn. Neurodyn. 2, 115 (2008). G. Deco, V. K. Jirsa, and A. R. McIntosh: Emerging concepts for the dynamical organization of resting-state activity in the brain., Nature Reviews Neuroscience 12, 43 (2011). J. Cabral, E. Hugues, O. Sporns, and G. Deco: Role of local network oscillations in resting-state functional connectivity, NeuroImage 57, 130 (2011).